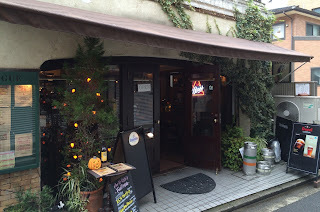 I had been meaning to get to Kichijoji for a while as there are a few bars there that I needed to check out. I finally did it last weekend, so here is the Kichijoji round up (to be added to if required in the future). For some reason I decided to walk there from Yoyogi Uehara and it was one of the dullest 11km walks I have ever done, so I would recommend taking the train. It did give me a bit of a thirst though. There are a couple of well-established places here that I imagine are suffering a little with the arrival of Craft Beer Market, so I have added them in the interest of fairness. I realise it must be pretty difficult for independent places to compete with the chains. Although it has become a bit tricky to work out what places are independent these days as there seems to be a lot of chains that don’t look like chains. Plenty of places have the same owner and therefore bulk purchasing power, but market themselves under different names. I have a loose plan to post something on here about that, but it seems like it might be quite tricky to work out. Anyway, my Kichijoji round up presented in brief and in chronological order as visited. - Nice little Irish pub tucked away in the side streets just south of the station. - Seven counter seats and tables for about 20. - 6 taps, but the three regulars are not so exciting (Heartland, Guinness and Kilkenny!). The guests seem to be mainly imports with the occasional Japanese craft beer in there (Ise Kadoya when I was there). Prices start at ¥650 and ¥1000 for the Japanese craft end of the more interesting stuff. The imports are a little extra. Thornbridge Jaipur was the most expensive at ¥850/¥1400. Selection of import bottles too. Before the huge boom of places opening I guess this would have been more appealing. It’s still a nice place, especially if you are looking for a nice location rather than a huge beer selection. I liked the feel of the place but I doubt I will be back as there are more places around that have beer I am more interested in drinking. However, they do publish their taplist from time to time on their Facebook page and there is no cover charge, so if you see something you fancy and you are in the area I’m sure you’ll enjoy popping in. Thanks for these reviews! They're all in my neighborhood, so I'm keen to check them out soon. Nice round up. Of the places mentioned, I'd guess that Camiya is the one most affected by the arrival of CBM. Rogue and Bicke have been around long enough to develop their own following. I live in the area and pass by Camiya at different hours and have never seen more than a few people there---they really need to up their game in some way, either through lower prices, better advertising, or, well, something, in order to survive---and I hope they do because I like stopping by there from time to time. Thanks for the comments, Al and Alex. Camiya is the most similar (type of beers available) and the most different (price) to CBM, but you're right, they are probably fighting for the same customers. Pleased to hear that Rogue and Bicke have regulars. They are nice places, but even though they are probably not that old (I guess, I don't really know), they definitely felt like they were not particularly on trend in the way that the more recently opened bars are. Thanks for the comment Beerhound. Seems that Camiya and CBM have both split opinion a little. I'm not 100% sure where I stand myself!